Flour is a very basic ingredient in almost all baked goods. The most common flour is made from wheat, but it can be made from many other grains, and also from nuts and legumes. Flour is used mainly for its carbohydrate content, but also for its protein content. Wheat is the most commonly used grain in the world, but is relatively new in history. It has many cousins, typically ancient grains domesticated from wild grasses. These include spelt, emmer and kamut, and a more distant cousin, amaranth. The predominant nutrient in wheat and other grains is carbohydrates (sugars, starches and fiber). The major protein in wheat, rye, barley, spelt and kamut flour is gluten, which lends elasticity, accommodating expansion of the dough/batter during a rise. Oat doesn’t have gluten in the grain, but packaged oat is often contaminated with gluten from wheat. Additionally, oat has avenin, a protein similar to gluten that causes sensitivity issues for some people. Gluten in wheat is formed from two proteins, gliadin and glutenin that combine upon exposure to moisture (such as at germination), to form gluten. Check out the Bread Science website (15) for an animation of this process. Whole grain, nut and legume flours are also rich in vitamins, minerals and oils. However, for the most part, the minerals are not available for absorption because they are bound by phytates, until after they have germinated or sprouted. Refer to Grains: Soaking & sprouting grains and Sprouting Grains, Legumes, Nuts & Seeds, for Eating for more. There are many ways to categorize different varieties of wheat, such as hard or soft; winter or spring; red or white. Hard wheat has a higher protein content (especially gluten) than soft wheat. There are many ways to classify the different types of wheat. Soft wheat (for pastry flour), which is lower in protein, and higher in carbs, and thus best suited for pie crusts, cakes, cookies, muffins and most pastries. Red wheat, which has all the original color of the bran, and a slightly higher protein content than white wheat. Red wheat may have a slight bitter taste compared with white wheat. White wheat, which was developed by removing the genes for bran color. (This is not the same as white flour, which is ground not from the whole seed but just the endosperm; however, products made with whole white wheat are lighter in color than those made with whole red wheat). A third classification is meaningful for farmers, as it determines the best time for planting the seed for crops. Both types can be either red or white. Spring wheat, which is sown in the spring and harvested in late summer. It has a slightly higher protein content than winter wheat. This is wheat flour ground from the endosperm, the starchy (high-carb) inner core of the wheat grain; it contains none of the bran or germ, and thus is not a whole-grain flour. Most white flour is ‘all purpose’, meaning it is a blend of hard and soft wheat so that it will work for both yeast-risen breads and soda-risen baked goods. Unfortunately, white flour has been stripped of most other valuable nutrients such as B vitamins, minerals and fiber, because these are in the bran and germ of the grain, which is stripped away to isolate the endosperm. What is left is carbohydrate and protein (mostly gluten). Oils: Most of the oil in grain is contained in the germ, or embryo, of the seed, which is stripped away to make white flour. Vitamin E, a natural antioxidant present in the germ to protect the fragile oils, is also lost. 97% of dietary fiber (3). When reading labels of prepared foods, note that “wheat flour” is white flour, not whole wheat. This is what most recipes in modern cookbooks list in the ingredients. It is ground from a blend of hard and soft red wheat varieties making it suitable for all baking uses: yeast breads, quick breads, cakes, cookies, puddings, etc.. However, I would not recommend its use because of its poor nutritional value, and questionable added ingredients; instead, I would use unbleached all-purpose white flour (see below). Regular all-purpose flour is ‘enriched’ by adding certain B vitamins to increase its nutrient content to resemble that of the whole grain. However, these vitamins are of questionable value because they are not part of a whole food and many are synthetic. 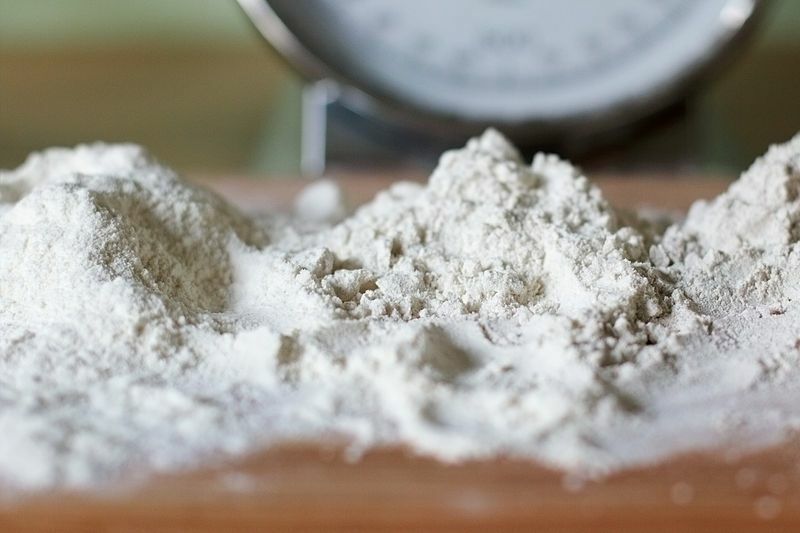 All-purpose flour is treated with several bleaching agents used to make it as white as possible. These bleaching agents include chlorine dioxide and benzoyl peroxide, known skin and respiratory irritants; methyl bromide, nitrogen trichloride, alum, chalk, nitrogen peroxide, and ammonium carbonate. And if that isn’t enough, the chlorine dioxide reacts with the protein in the flour to produce a toxin called alloxan, which is used to induce diabetes in lab animals (1,2). Do you really want all those chemicals in your body? However, the biggest issue I have with all-purpose flour is that the wheat used to make it is most likely GMO. Like regular all-purpose flour, this is also ground from the endosperm of the grain, but is not treated with toxic bleaching agents, and it may or may not be enriched with added vitamins. Unless it is Organic, it could be made from GMO grain. I always choose Organic unbleached white flour when I need a white flour, but most of my recipes have been adapted to use whole wheat flour or sprouted wheat flour. It is available as an all-purpose flour, hard wheat (bread) flour or soft wheat (pastry) flour. Good brands include ing Arthur Flour (KAF), Wheat Montana, and Bob’s Red Mill. This is simply all-purpose flour with baking powder and salt added as leavening. You can substitute unbleached white flour and add 1 ¼ tsp baking powder plus ⅛ tsp salt per cup of flour (if you use unrefined sea salt, use a rounded ⅛ tsp, as it is a coarser salt that table salt). What we call ‘semolina’ comes from hard durum wheat, which is a high-protein flour, and is light honey in color, resembling a pale cornmeal. It is used to make pasta and couscous. Durum semolina is used to make pasta, gnocchi, puddings, hot cereal, and is also used in some breads, cookies and cakes. Bran is the protective outer shell of the grain berry (seed). It is comprised of non-digestible starches known as ‘fiber,’ and digestible starches, protein, vitamins and 50 – 80% of the minerals in the grain. Germ is the embryo part of the seed; that is, the part that will form the sprout upon germination. Wheat germ provides an impressive bundle of nutrients including vitamin E, folate, phosphorus, thiamin, zinc and magnesium (4). The germ is also rich in poly-unsaturated oils (fats). Once separated from the whole grain and the protective bran covering, the germ is highly susceptible to oxidation (rancidity). Endosperm provides nourishment for the growing sprout after germination, and is comprised mainly of digestible starches. Whole wheat flour contains all the original nutrients of the grain berry (seed). However, once ground into flour, it can easily become rancid, so it is best to keep ground whole wheat flour in the refrigerator or freezer (allow it to come to room temperature before using). Better yet, grind your own right before using. It’s also important to note that most of the minerals in the grain are bound by phytic acid. This bond is not normally broken by digestion; thus the minerals in the grain are largely unavailable for assimilation during digestion, and pass out in the stool. This binding in the seed is necessary to keep the minerals from activating the enzymes prior to germination. If they were activated before germination, the seed would germinate when conditions are not ripe for growth of the young plant, and it would likely spoil and die. The entire grain is ground together to make this flour, giving it a brown color. When used in baked goods, it imparts a heaviness to the final product, and for this reason is often used in part with white flour to lighten the final product. This heaviness can also be mitigated by incorporating more water in the dough/batter. For breads, one also needs to knead the dough longer, and allow for a longer rise time to ensure a lighter loaf. Red wheat can be hard or soft depending on the variety. Hard red wheat is high in protein and gluten, and is most suitable for breads and pasta. Soft red wheat is lower in protein and gluten, and is most suitable for cakes, cookies, quick breads, muffins, etc..
LIke whole red wheat flour, the entire grain is ground, but because the grain itself is lighter in cooler than red wheat, the flour is also lighter, nearly as light as white flour. Both hard and soft white whole wheat flours are available. My preference for a whole wheat flour for bread making is hard white winter wheat, such as Prairie Gold from Wheat Montana (16), but similar flour can also be purchased from Bob’s Red Mill (17), and King Arthur (18). It is lighter in texture and color than red wheat flour, but it still 100% whole grain, and as a hard wheat, is high in protein and gluten. Generally graham flour is made from red wheat, but I imagine it can also be made from white wheat. Like regular whole wheat flour, graham flour is made from the whole wheat grain. However, the three parts are ground separately. The endosperm is ground fine, as for white flour; the bran and germ are ground coarse, and then combined with the ground endosperm to make the graham flour. It has a distinct sweet flavor one recognizes from graham crackers. An excellent graham flour can be purchased from Bob’s Red Mill (17). Bread flour is a high-gluten, hard wheat flour, and is high in protein (12 – 13% protein). It is wonderfully elastic. In the US, it is often bromated to improve gluten activity (this process is prohibited in most other countries because of the toxicity of the process), so look for Organic bread flour, which is not brominated. Bromate is a powerful oxidizer and can cause cancer. Bread flour can be found in white and whole wheat versions. I don’t usually have either in my kitchen, and use the hard white wheat flour (see whole wheat flour section above). Cake flour is a white flour. It is lowest in protein content at 5 – 8% protein, and highest in carbohydrate, and is the least elastic. Like pastry flour, it is made from soft wheat berries (8 – 9% protein), and is suitable for use in cakes and cookies, giving them a very tender crumb and high volume in the rise. Cake flour is also more finely ground, but unless it is unbleached, it is treated with even more toxic bleaching agents than all-purpose flour. I’ve never seen whole wheat cake flour. If you want to use whole wheat flour (or a mix of whole and white) in a recipe calling for “cake flour,” try replacing about ¼ of the total wheat flour with barley flour, as the barley flour is lighter than wheat, for a great mimic of cake flour. See Barley Flour (below) for more. Joy the Baker (4) offers a ‘recipe’ to make your own cake flour using all purpose flour (I’d use unbleached) and corn starch (make sure it is Organic, to avoid GMOs; tapioca starch can also be used but use 2 Tbsp tapioca starch for each 1 Tbsp corn starch in the method). This method requires a lot of sifting to aerate the flour. Moved to Bulgur & Bulgur Flour post. This entry was posted in Grain, Nuts and seeds and tagged flour, wheat. Bookmark the permalink.